There are so many things you can take back from A Million Sitas. There is marvellous storytelling, narration at its best; there are the gorgeous costumes creating lives and complementary characters; there is the saucy, yet reverential take on the key women, an interpretation of an epic done so many times across genres and cultures. Where almost all have found something to point out. Yet above all of these, there is the encapsulation of a love story, not any less tragic than celebrated ones like Romeo and Juliet, Heer Ranjha and the many untold ones which don't necessarily end with a walk into the sunset. The point here being, it is better to love and be damaged because of it, than not at all! Love transcends obstacles and it is meant to be unconditional - regardless of how things go! The physicality of beauty and body attraction, are the attractive traps that get the connection going. What follows post that, is true test of character and strength. It applies to women and men. Men do what they have to and in the way they are trained to. It is a patriarchal system and that's where they operate out of. You could say they are the catalysts to move a story forward and are pawns in a dark, tricky game of chess. The chessboard is this huge karmic concentric circle, going on and on with no apparent view of justice. The queens on this board are the ones who actually dictate events that unfold in the way they do by the force of action and reaction. And this is what lies at the rationale of A Million Sitas, which portrays all the dynamic women propelling the story forward and in the process becoming realised, independent and with self-worth. This is perhaps not really reflected in the direct and simplistic narration of -in this case - the Ramayana, unless it is interpreted by out of the box thinking of what qualified the thinking of key women in the story. Who really was there to record whether they wanted to slap the weak men or whether they could not have fought physically, considering almost all of them were trained as warriors? A story with such silent subtitles would have sunk through the ages in a country where men are considered the more powerful lot. Then comes something that motivates you to examine things that is taken for granted in a story like this. Which is why Anita Ratnam's take is exceedingly interesting and relevant in the context of changing gender equations today. Come to think of it, women are being brought back to understand their uniqueness and reinforce a sense of purpose more than ever. A Million Sitas does that at various levels. First the story! The origin of Sita! Born of the Furrow and also of a Sneeze from the demon Shiva bhakta, King Ravana of Lanka. She is sent off to die (a la Moses by the Egyptian princess in a basket). Her arrival meant the death of this king. That's what the learned soothsayers proclaimed! While playing with the great Shiva Dhanush at Mithila, this little ball of force lifts it easily. Father Janaka realises that this is no ordinary child and would need someone equally powerful to match her. Cut to the birth of Rama. The first born and a prince of Ayodhya who will be king. Well versed in every possible part of warfare and the arts, he sets off on a journey that will change everything. Finishing with the rituals of a short tempered sage, they wander into Mithila. The little Sita sees Rama and it is love at first sight. Such young love! But Rama must conquer the Shiva Dhanush before he can make the princess his wife. He does and they marry. From here begins the roll of the dice so to say of their prarabdha - and the play of destiny. Who says it is happily ever after? Betrayal, deceit, greed and lust interplay in the lives of Sita, Manthara, Kaikeyi, Surpanakha, Mandodari, Ahalya and many more as the epic continues. And each one of them have a role to play in the way things have to pan out. It couldn't have any other way! The entire production was of dexterous story telling. Anita has studied drama and theatre and ensures that she weaves her dance background into the story-theatre making it gripping for the tales behind tales. Case in point a parallel of the frog turning into a prince. Here Mandodari is actually a frog materialised by Goddess Parvati. Shiva is not known as Bholenath for nothing, Anita intones! When Ravana requests Shiva to come with him to Lanka, Shiva declines. 'But if you don't come, can I marry Devi and take her back?' Being gullible as the other name suggests, He grants him his wish! And here, out comes a green glove. Anita rises above the lotus pond to engage in the imagery of Goddess Parvati, transforming a green frog as a beautiful woman. Ravana knows nothing of this deceit and goes back taking his queen. Sita herself is a contradiction. The famous Sita Kalyanam Vaibogame that is an ode to her and to everything to do with a happy, successful marriage, has tragic overtones in its ineffectiveness to deliver a happily ever after. And this, points out Anita, is still sung during weddings. Interspersing real life incidents of her own youth with her mother with that of mythology, Anita brought an aspect forward not many actually think of. Anita spoke, swayed, sashayed and cast a spell like the celestial being who could go up a cloud at will! That and the live percussion support (N.K. Kesavan) and vocals (Snigdha Venkataramani) was electrifying in its inherent drama. You got taken in without even realising that this is a story you have grown up with! To me, what was also extremely delightful was Sandhya Raman's work with Anita and Snigdha's costumes. Everything from the look of a beautiful Indian princess with all her traditional finery or of an oriental adornment with gold claws and head gear (and the extra fabric for Surpankha and Ravana sourced by Anita from Japan, Thailand and Malaysia), each element was designed to provide visual appeal. The other thing that stood out was the role and the motivation of Manthara to twist things like a political pro. Moving with a basket and a long stemmed lotus, there was double layer of interpretation. The lotus is a strong symbol and its use could mean many things. Manthara is the trigger to change the course of history. And then again, unless that happened how would a story have its drama? Ahalya became the grey voluminous fabric that Anita wrapped around herself as she narrated the tale of this pure woman tricked into passion. A cold unfeeling husband, Sage Gautama was to be her plight because she was created too beautiful to be used. A lustful Indra comes across and she is soon cursed to become stone till redemption comes about through the presence and touch of Rama. This can be seen two ways. That the Divine is assumed to be male energy and that redemption comes here? Or that the female freezes over and opens up only when she is ready? There was not much dancing and it didn't matter. 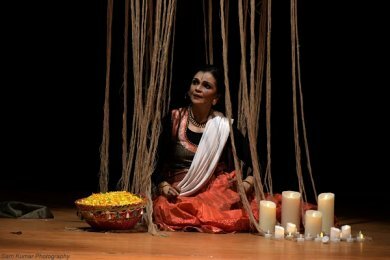 In the forest, Sita is confronted by women who will draw her closer to the separation from her husband and marriage. The Queen of the jungle, Ravana's sister, Surpanakha of the long, green nails and a crown (embodying the oriental flavour) allows herself to be humiliated and disfigured by Lakshman. Allows is the catalytic word, just as Sita refused to ride on Hanuman's shoulders and asks that Rama fight for her and take her back. Yet she is suspected - rather it is her word against that of public opinion! This is where Anita calls out to the other women in the world out there to bring their consciousness to their own truth and strength. Justice can only be delivered by themselves. And the price to pay for that is to stand up for the person that a woman is! 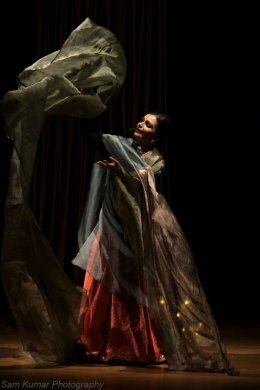 The lighting design, amazing sets (by Reshma Chhiba in Johannesburg) and props by Rex (lotus pond, the basket, the gold nails, the green glove and the grey diaphanous fabric that was Ahalya) created a surreal world where time and space meshed and created ripples of reality. A profusion of eyes for Ravana on one side and a sheer drop in organza for the gentler aspect of the story on the other side brought much beauty to the story telling. Anita used all of the props with dexterity and aplomb knowing she, Anita, Sita and the hundreds of women she is addressing are making an impact. 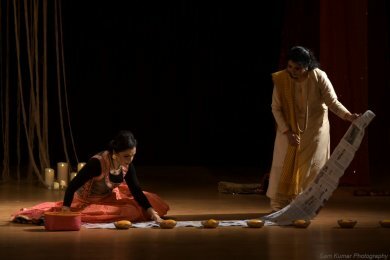 "There is no Rama without Sita," Anita has said with regard to this production. "If Sita had not followed Rama into the forest, there would be no story; if Sita had not refused to escape with Hanuman from Ravana." Anita also says she has researched several texts, books, cultures and folk traditions about the same story described and told differently. "There are so many versions," she says. It is finally not about the versions. It is about applying the changing ethos of what a woman stands for today. It is possible that even those days they were feared and respected for their fierce, independent decisions. This is the core of A Million Sitas. Chitra Mahesh is a cultural commentator, performing arts critic and a life coach.